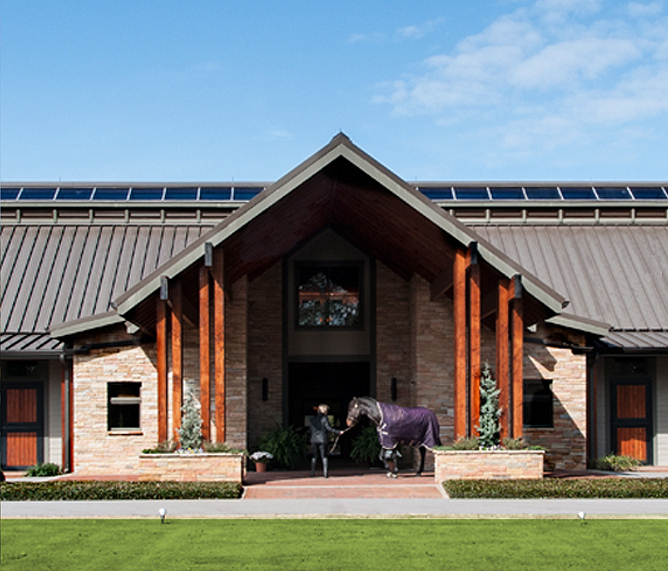 Horse barn ventilation Archives - Blackburn Architects, P.C. : Blackburn Architects, P.C. We recently wrote about muck pits and dealing with manure at horse facilities and received comments about stabling time; some saying that shorter times in stalls are better for horses. We completely agree. The longer a horse is stabled indoors, the more likely it is that the animal will be standing in urine-soaked bedding for at least part of the day. And we all know ammonia causes problems. We want the air inside our barns to be as clean as the air outside the barn. Blackburn Architects’ designs stress aerodynamic ventilation, strategic natural light, and passive solar heating and cooling in our equestrian facilities. 1. The Bernoulli Principle – As air blows across a surface, e.g. a bird’s wing, it creates lift. Barn placement on a site is critical. If possible, a barn should capture the prevailing summer breezes (for horses you’re always more concerned with cooling rather than warming). Inside the barn, air needs to move up and out. Blackburn frequently specifies ridge line vents in our designs. The vertical ventilation rids the barn of odors, pathogens and infectious bacteria that could otherwise be transported from horse to horse. Even in cold climates like Montana, Blackburn Architects designs for maximum ventilation in the winter. “A horse gives off a tremendous amount of humidity; a lot of bacteria and in a contained area – like a stall – that’s an incubator for disease. I don’t care how cold it is where you live, you want to ventilate your barn year-round,” explained John Blackburn. 2. The Chimney Effect – Maximizing natural light in a barn creates a healthy environment by helping to “sterilize” the spaces. For example, as the sun moves across the sky and a band of light travels through a stall – perhaps through the upper portion of an exterior Dutch door left open – it helps to dry and evaporate urine. Blackburn Architects’ spaces have a lot of windows, and skylights. Vented skylights glazed with a translucent polycarbonate panel running the length of the barn are hallmarks of our barns. The light source provides a low cost, shatter-proof feature that diffuses the light, thus eliminating harsh shadows, which could cause horses to spook. “My barns are designed to function throughout the day without the use of artificial lighting, except in enclosed rooms such as bathroom/laundry,” John Blackburn explained. If you want to learn more, Penn State Extension has a very informative article: https://extension.psu.edu/horse-stable-ventilation.